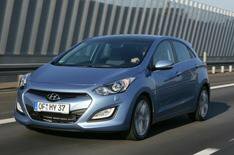 Hyundai i30 prices revealed | What Car? The new Hyundai i30 hatchback will cost from 14,495 when it goes on sale on March 12. It will be available in four trims: Classic, Active, Style and Style Nav. The 2012 i30 is available with a choice of two petrol or three diesel engines, including Hyundai's new 108bhp 1.6-litre diesel, which has CO2 emissions of 97g/km. Hyundai Blue Drive technology - including engine stop-start - is standard on all 1.6 CRDi manual models. Standard equipment for entry-level Classic trim includes voice-activated Bluetooth, LED daytime running lights, USB and auxiliary input socket, air-con and electrically adjustable, heated door mirrors. Extra kit for Active trim includes 15-inch alloy wheels, cruise control, electric rear windows, rear parking sensors, extra chrome trim and Hyundai's Flex Steer system, which has three settings: Comfort, Normal or Sport. Style models get 16-inch alloys, dual-zone climate control, front parking sensors, rain-sensing wipers, cornering lights, automatic headlights and electrically folding door mirrors with LED indicators. Range-topping Style Nav adds an integrated touch-screen sat-nav system and rear-view parking camera. Standard safety kit across the range includes front, side and curtain airbags, stability control and hill-start-assist. A driver's knee airbag is a 120 option for all but Classic models.